With a nod to “Star Trek,” George Takei opened festivities marking the start of construction on the Metro Regional Connector project on Tuesday. The ceremony took place on the Mangrove property across from the future site of the First Street/Central station. 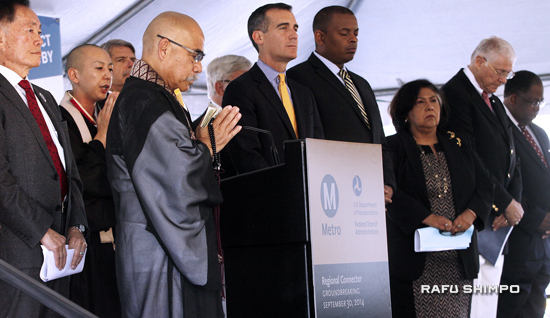 Federal, state and local officials wielded shovels to officially break ground on the 1.9-mile, $1.42 billion project that will connect the Metro Blue, Gold and Expo lines with the rest of the region. The Regional Connector project, expected to be completed in 2020, will attract nearly 17,000 new daily riders, making the Little Tokyo station one of the busiest in the entire transit network. Transportation Secretary Anthony Foxx traveled from Washington to attend the ceremony. Foxx praised the “grit and determination” that has brought the Regional Connector to this point, saying that it will help L.A. workers and boost economic development in the region. A Full Funding Grant Agreement (FFGA) with the federal government secured $670 million for the project. In addition, the U.S. Department of Transportation has granted Metro a loan of $160 million for the Regional Connector project from a Transportation Infrastructure Finance and Innovation Act loan (TIFIA) to complete the project. “We know that the way to a better job is often a way to get to a better job. A subway station, a bus route, a light rail line can be a lifeline for a family, for a community, for a city and for a region,” Foxx stated. Los Angeles Mayor Eric Garcetti noted that the city has invested $36 billion in transportation infrastructure, but that the Regional Connector project is unique. Regional Connector funding was also provided through Measure R, the half-cent sales tax ordinance for L.A. County transportation improvements. 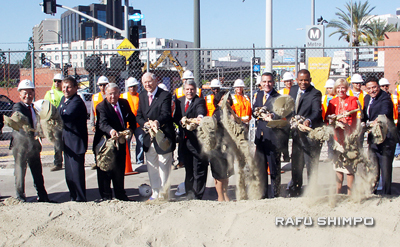 Public officials shovel dirt marking the start of construction on the Metro Regional Connector, a 1.9-mile transit project that will connect the Blue, Gold and Expo lines and provide seamless travel throughout the rail network. The mayor also announced the opening of a community relations office on First Street. Other dignitaries in attendance included Rep. Janice Hahn, Supervisor Don Knabe, Supervisor Gloria Molina, Supervisor Mark Ridley-Thomas, Supervisor Mike Antonovich, Glendale Councilmember Ara Najarian, and L.A. Councilmember Jose Huizar. Rev. William Briones of Nishi Hongwanji Buddhist Temple gave the invocation. Entertainment was provided by TaikoProject and students from the Colburn School Conservatory of Music. Molina focused her comments on the impacts of construction on Little Tokyo. Molina, who also serves on the Metro Board of Directors, announced that she would be introducing a motion to create a business interruption fund at the Metro Board meeting on Thursday. The motion would establish a fund to compensate for losses for mom-and-pop businesses within the Little Tokyo area impacted by the Regional Connector. Businesses along the Crenshaw Line would also be included in the special impact fund, targeted at businesses with 25 or fewer employees. Molina said that Ridley-Thomas, who also sits on the Metro Board, is joining her in the motion. She said the motion would be a way to help small businesses cope with the disruptions caused by years of construction. “We want to make them as whole as possible. Because we want them to be here in our neighborhood when this is completed. They need to benefit as well,” Molina said.